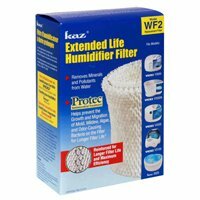 INDICATIONS: Kaz Humidifiers, Natural Mist Wicking Replacement Filter, #WF2. Store Features: Genuine, new, unopened products. We don't sell used, expired, knock offs or copies. We donot charge separate for handling. Heavy weight items will have handling charges. Almost All Domestic Orders over $100 get Free Shipping. Conditions apply. No worry 7 day return policy (see policy pages for details). We respect your privacy. Hence we do not Spam your mail box. Image & Appearance may vary from the actual product. Kaz Humidifiers, Natural Mist Wicking Replacement Filter, #WF2.